Longarm services are provided using an APQS Millennium. 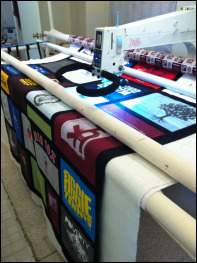 With a 12 foot frame, the machine can hold up to king size quilts. An APQS Quilt Path computer was installed summer 2018. This opened up a whole new world of custom, semi-custom and pantograph design options! At Foxtail, t-shirt quilts and memory quilts are made with special attention to detail. For those who want to be actively involved in their project, much effort is dedicated to producing a quilt that reflects your vision. Whether you want to see step-by-step photos or be surprised, your project is given individualized attention, and it's understood that a bit of rearranging t-shirts, piecing blocks, added appliqué or embroidery may be necessary to get it just right. Backing fabric selections are based on themes and personal preferences. I work with each customer during the selection process. Some customers have specific requests and others don't know where to start, so options are provided to choose from. Quality quilts are made with quality fabrics, threads and batting. Foxtail's preferences are Moda fabrics, Glide thread and Winline batting. A large variety of threads are kept on hand, so it's likely that the perfect color and shade for your quilt top will be readily available. Work area for piecing your memory quilt! A professional heat press is used to ensure even and thorough application of stabilizer to each shirt used in t-shirt quilts. use of texts and emails to exchange photos make it easy and affordable to work with out of state customers. There are no limitations on U.S. service areas. Projects can be affordably shipped to all military (APO/FPO/DPO) addresses.